From its inception, the goal of #MCSMN has been to help lead the social media revolution in health care: to provide a gathering place for those interested in health care applications of social media to learn with us and from us…and us from them. Until now, Basic members have had access to the #MCSMN blog, our curated News You Can Use and various Mayo Clinic resources. We’re opening the Discussion forum to Basic members. Until now this forum was only available to Premium members. With this expanded access we hope you'll jump in with your questions and also share your insights with the community. We believe this will create significant value for all of our members, getting more perspectives involved in discussions and drawing a larger and more diverse community of interested social media advocates. We're reducing annual dues for Premium membership by 40 percent, from $495 to $295. 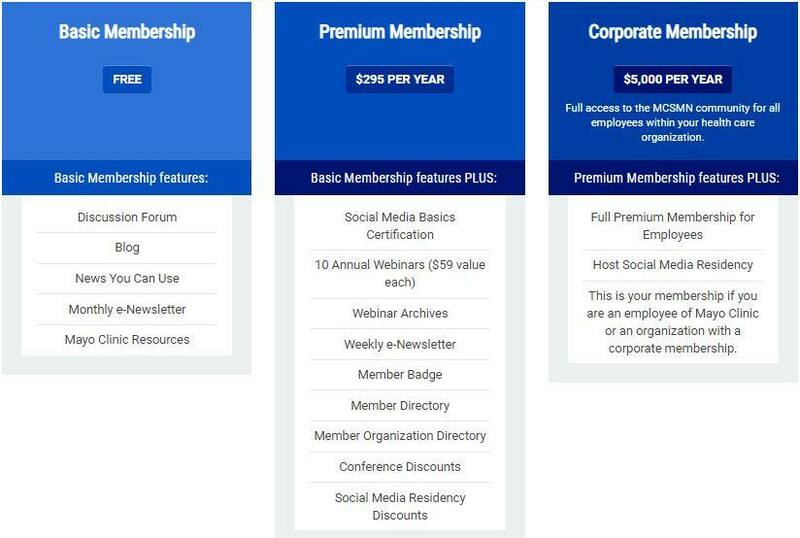 Premium members get access to training resources such as the Social for Healthcare Certificate and all of our monthly Webinars, as well as 25 percent savings on registration for in-person events like Social Media Residency and our Annual Conference. In coming months, we'll be adding in-depth and specialized learning modules. The content and conversations will relate to physicians, nurses, researchers, human resources and other health care professionals, as well as our current core community of communicators and marketers. While these resources will be available to others for separate purchase, we'll include them at no extra cost for our Premium members. If you are a leader or advocate for social media in your organization, we’re making Corporate membership in #MCSMN more valuable too. For annual dues of $5,000, all employees of Corporate members are eligible for the full Premium benefits listed above. They get access to the same online social media learning resources Mayo Clinic staff enjoy. So whether that's 20 or 20,000 employees, everyone who shares your email domain can receive Premium access for one reasonable flat rate. One thing that's not changing: our Corporate and Premium members will continue to receive a 25 percent discount on any of our in-person events, including Social Media Residency and our Annual Conference. Check out our updated membership options. Are you taking full advantage of your #MCSMN membership? There's a whole range of new benefits for #MCSMN members. #MCSMN is doing even more now to lead the social media revolution in health care. Have you joined the #MayoClinic #SocialMedia network yet? There's no time like the present.